Can Solar Energy save India's Taj Mahal? Can Solar Energy save India’s Taj Mahal? 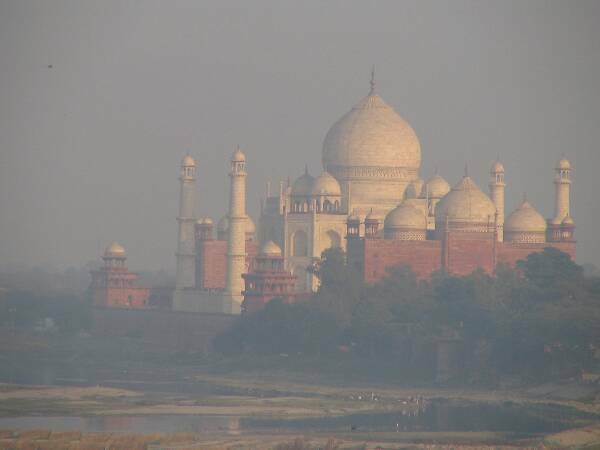 The Indian state of Uttar Pradesh says that it wants to develop Agra as a solar city in part so as to save the Taj Mahal. The Taj Mahal, a Moghul monument built to commemorate the Indian queen Mumtaz Mahall by her grief-stricken widower, Emperor Shahjahan, was completed in the middle of the 1600s and is in my view the most beautiful building in the world. It just floats there, and everyone should see it once in a lifetime. The Moghuls had access to marble from Rajasthan, but in recent decades air pollution in the gritty industrial city of Agra has turned the marble yellow and threatens it with acid erosion. Renewable energy– wind, solar, geothermal and hydroelectric– has many advantages, especially that of reducing the dangers attendant on climate change produced by carbon dioxide emissions. But just preserving us from the bad environmental effects of coal-burning plants is underestimated as among their main benefits. Coal produces acid rain, high mercury emissions (a nerve poison) and causes lung diseases and cancer. India is planning to install 20 gigawatts of solar photovoltaic capacity by 2022.